Focal Upright, the creative minds behind the immensely popular Locus Desk, are bringing their design expertise to conference rooms with their Confluence Collaboration Table. Purpose-built for the Mobis- and Mogo leaning seats, the Confluence lean-to-stand conference table makes for faster and more productive meetings. Crank mechanism adjusts height at one turn per inch. Lift capacity of 300 lbs. Table top customization options include laminate, wood grain veneer, and dry-erase. A unique foot rest provides improved leg comfort for Mobis- and Mogo users. Pretty expensive for a manual height-adjustable table. 36" minimum height discourages the use of standard office chairs. Editor’s Note: The following is a “forensic” review. We have not yet tested the product in our lab as it is not yet available. What follows is our review of publicly available information that Focal Upright has released. Be sure not to miss our full-fledged review by subscribing to our free newsletter. With the debut of the Locus Adjustable-Height Leaning Table two years ago, Focal Upright Furniture cemented itself as a leader in workstation design for the modern office. 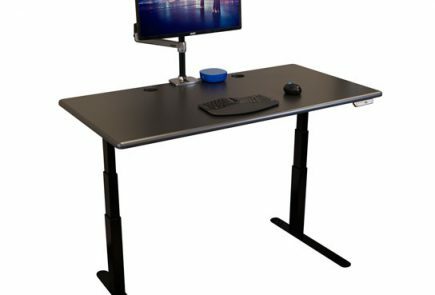 We were impressed by the expansive, height-adjustable and tilt-adjustable drafting table top, and by the suite of accessories with which users could customize their desk. 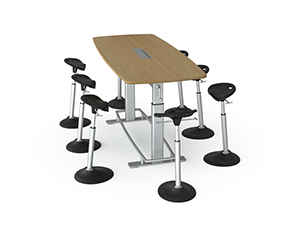 The Locus seat – one of the first “leaning stool” active chairs – stood as the cornerstone of the desk system’s design, providing a unique seating solution that was ergonomic, elegant, and for most people, quite comfortable. Not content with individual office workstations, Focal is expanding their repertoire, and setting their sights on meeting rooms. Their new adjustable-height conference table, aptly-named the Confluence Collaboration Table, brings Focal Upright into the growing movement to take the standing meeting to offices across the country. Anyone familiar with the Locus Desk will feel right at home with the Confluence Table. The 1” thick table top is made of the same hardwood plywood and veneer as the Locus desk, and the base even has the same nautical-style crank handle. 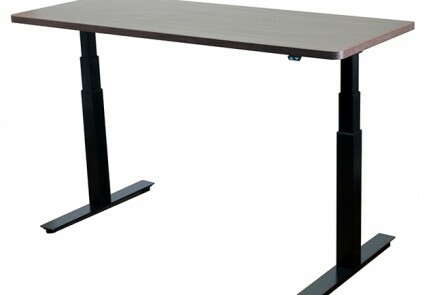 The height-adjustment range of 36” to 48” is identical to that of the Locus desk, meaning that the Confluence is not a true sit-to-stand conference table, but rather a unique piece of furniture designed to be used either standing or leaning. It was purpose-built to go together with Focal Upright’s Mobis leaning chairs as a matched set. the concave front edge of the Locus, the Confluence instead sports a convex edge. A cable management tray in the middle of the table keeps laptop cords out of sight, and a foot rest rail surrounds the base of the table. We found the foot rail to be rather essential when using leaning chairs. Without it, some users might feel a strain on their outer leg muscles (somewhat akin to a shin splint), or that their feet are getting squeezed into the front of their shoes as they divvy the support of their entire body weight between their legs and the Mobis – essentially forming a tripod. The Confluence foot rest places users’ feet in a more comfortable neutral stance, reducing that risk. The foot rest also adds tremendous stability to the entire table, making it rock solid. The Confluence base has also been given a mechanical upgrade over the Locus. 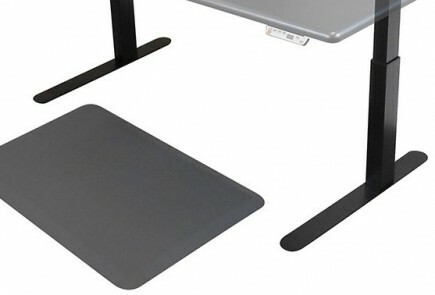 Its lifting mechanism adjusts the height of the table at a rate of one turn per inch, faster than its desk counterpart (and faster than any crank base on the market). It also outshines in weight capacity, rated to 300lbs – an impressive feat for any crank-adjusting base. The Confluence Table comes in two sizes: 78”x34” or a larger 94”x36”. You can choose between a black or white laminate, or go for a dry-erase table top. White Oak or Black Walnut wood finishes are available as special orders. The synergy between Confluence and Mobis is also evident in Focal’s pricing. Starting at a pricey $2,999 you can get a standard Confluence Table for your office. But a $5,499 bundle also nets you six Mobis Seats, for a ready-to-go lean-to-stand conference room. A $999 bundle add-on sweetens the pie with ten Mogos, ensuring everyone on your team gets a seat. The designers at Focal Upright have taken a unique approach to unseating the conference table. And the Confluence certainly stands out from the small but rapidly growing lot of adjustable-height conference tables that are just now hitting the market. If you’re into the leaning chair design – for some it’s an acquired taste – then we can state categorically that there isn’t a table available today that is more suited to it than the Confluence. However, the Confluence is not like the rest in some very important ways. It is not a true sit-to-stand conference table, with its 36” minimum height. You can stand next to it or lean into it on a Mobis or Mogo, but you can’t sit at this table. The height adjustment is manual, when other tables costing substantially less are electrically-powered, and offer up to 65% more lifting capacity, to boot. There are no AC power sockets or USB sockets in the table to plug your laptops, projectors and mobile devices into. So while the marriage of the Confluence table and the Mobis leaning stool will certainly stand out aesthetically in any office, at such a high price point it’s not likely to find mainstream adoption like the iMovR Synapse, NewHeights Elegante, or any of the other true sit-to-stand meeting tables now being offered.